There's still one month to go before LG officially unveils its Optimus G successor, but thanks to an anonymous tipster, we have a pretty clear idea of what it'll look like. 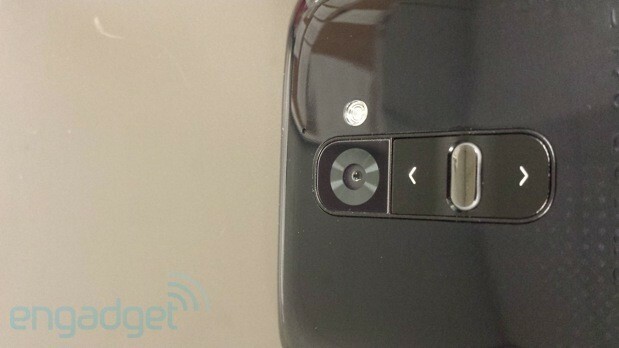 Similar to the G2 leaks we've seen in the past, this upcoming Android flagship falls more in line with the (LG-made) Nexus 4's rounded-edge design than the blockiness of the original Optimus G. As you can see in the image above, the purported G2's 5.2-inch, 1080p display is surrounded by very little bezel, making it appear near edge-to-edge. LG's also foregoing the three capacitive Android navigation buttons featured on the original G in favor of an onscreen (stock Android-like) arrangement. On back, we can clearly see LG is indeed going forward with that quirky volume rocker placement, which puts the controls just below the camera -- rumored to be a 13-megapixel module. Further corroborating earlier reports and LG's own official confirmation, our tipster pegs the G2's processor as a Snapdragon 800 clocked at 2.3GHz and paired with 2GB RAM. And although there are no visible signs of carrier branding on its glossy chassis, this particular G2 variant is supposedly headed to Sprint. Which, if true, lines up with the legacy set by the Sprint Optimus G -- a device that also launched free of the Now Network's logo. Apart from a few screens showing the launcher, camera UI and one of LG's various lockscreen options, there's not much more we know about its spec list (i.e. battery size). Though we fully expect more details to leak out in the run-up to August 7th. For now, check out the mini-gallery below and an additional, close up photo of the G2's volume rocker just after the break. Update: We've received additional photos of the G2's settings menu confirming this model as a Sprint variant running Android 4.2.2 Jelly Bean. Update 2: 4Leakz has posted a video (after the break) showing the G2 in action. Reportedly, the phone is "very comfortable" and reminiscent of the Nexus 4, but thinner.